Batman's cape and mask from The Dark Knight Rises! Roleplay piece perfect for younger Batman fans. Pretend your Christian Bale's Batman from the movie! 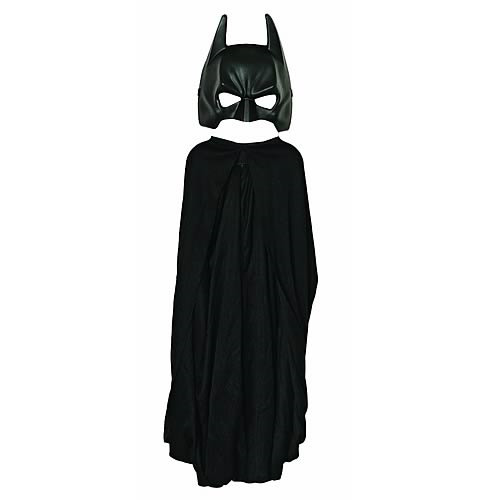 Any young Batman and The Dark Knight Rises fan can instantly transport him or herself into Christopher Nolan's action-packed movie with this Batman Dark Knight Rises Child Size Cape and Molded Mask Costume Set. It's Batman's awesome cape and mask from the movie in a slick black tone! If your young one is planning a Halloween costume or just an outfit for a themed party, he or she will love the cool look of this Batman set. Pair the Batman Dark Knight Rises cape and molded mask costume set with the Grappling Hook and Child Belt (sold separately) for the perfect look! Ages 6 and up.